Contemporary society has become extremely demanding, eating up the time we need for ourselves, imposing its stressful rhythms on our lives, colouring whatever we do and how we feel. We often find ourselves pulled toward the outside world, forgetting our own inner world, our own perceptions, feelings and aspirations. Awareness through the Body is a comprehensive curriculum of exercises that aims to raise awareness and enable both children and adults to become conscious of their own perceptions and abilities so that they may become more self-aware, self-directed individuals. It offers ways to discover the existing connections between mind, emotions and the physical body and to integrate these different parts into a more harmonious whole, organised around the inmost centre. 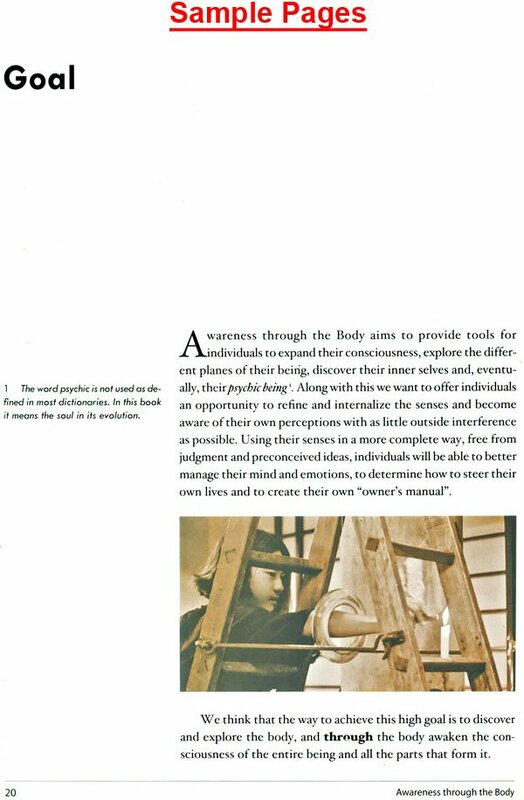 "This book provides a wealth of material in a systematic manner related to the theme of "awareness of awareness" and the "witness consciousness" through the exploration of the powers of the physical senses ... and increasing contact with the subtle body, and inner realms of consciousness." 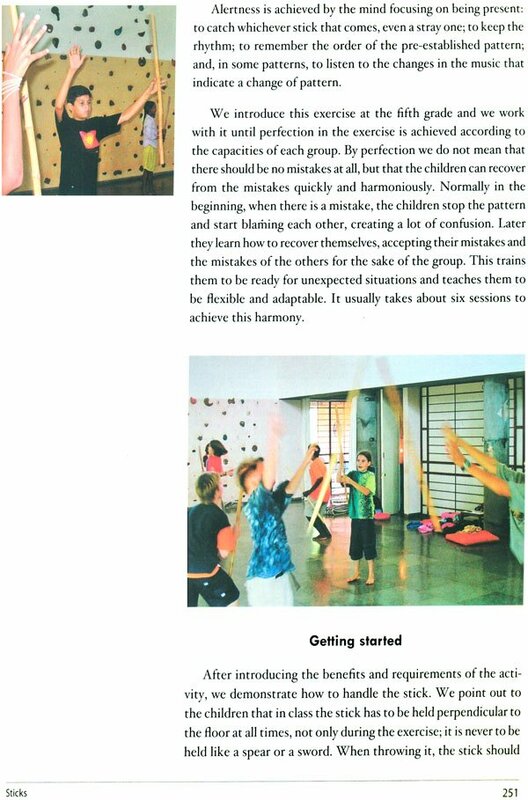 "Aloka and Joan's infinitely graceful co-teaching is warm, clear and uncluttered. Their unique work in guiding children to focus and relax is the right thing at the right time in a climate of scattershot educational requirements. These teachers are artists and experts and their practical lessons are invaluable and suited to any setting." Joan and Aloka asked me to write an introduction for this manual and immediately images, then recollections, finally stories began flipping through my mind like the pages of a photograph album. Here are some of the images Awareness through the Body brought up for me. A group of kindergarten children of all sizes, shapes and colours gather at the entrance to the hall, which is covered by a blue cloth. Aloka explains that they are going to go on a journey to the moon and they will need to be very quiet. They are going to go up a tunnel and come out the other side. She also explains that they must not touch the "ground" on the moon, but they can cross to the other side of the moon in other ways. All eyes are on her as she dramatically pulls the blue curtain and there is a sharp collective intake of breath, ahh! as the children see they are facing a large blue tunnel. One-by-one they squirm up the tunnel and come out on top of a ladder which leads to a series of platforms constructed of planks and set between stools, chairs and another ladder. There are two adults in the room, for coaching and spotting, but other than the low brook-like murmur of the coaches the room is quiet; the concentration so intense you could touch it with your hands. One-by-one as the children emerge from the tunnel they begin their journey across the moon, going carefully down the ladder, feeling their way onto the planks, some of which slope up, others down: the moon is not, apparently, a flat place. At the end of the course, triumphant they spill back into the place where the tunnel opened. I am observing in a science class at Transition, an elementary school in Auroville, when the bell rings and a rush of children, eyes sparkling, come chattering into the room, telling the departing class, 'Just wait until you get to Awareness through the Body!" I am a 74 year old aging academic who has spent far too much time sitting in front of computers, sitting in a car, sitting in meetings, sitting over a book. When I come into the afternoon adult class and see on the floor of the hall round wooden platforms with half a ball beneath, my heart does a drum roll. Some of the other members of the class are already balancing on these small platforms, teetering, but feeling their way to some kind of equilibrium. "Oh, no," I think to myself, "I will never be able to balance like that." But gradually I realize that whether I succeed or not is of no importance to anyone except perhaps myself. What I become aware of in myself, my own reactions, how my physical responses affect my mental or emotional balance is what matters here. Joan says quietly in his coaching voice, addressing no one in particular, "Balance is always a matter of imbalance", and as I absorb that bit of wisdom I stop thinking in terms of success or failure, and begin to focus on feeling and understanding the seconds of balance or imbalance as I too teeter on the balance board. Later I ponder over other instances in my life where balance was a matter of adjusting to imbalances. Here is the wisdom of evolution and growth which challenges us to continuous subtle changes and movements essential to maintaining equilibrium in response to other changes, internal and external. If at first glance, browsers think this is only a recipe book of physical education activities they couldn't be more wrong. Slivers of wisdom like this are embedded in the text, but more than that, they permeate the thinking and the suggestions are given in such a way that the adults and children alike absorb the wisdom without any sense of being preached to. "It makes the physical body much more real and you discover things about yourself." "They gave us exercises to quiet us down and then exercises to bring us back, exercises on how to develop the body senses and awareness, and how to use the senses and how to recognize feelings." "It made me more aware of everything around, and it made me much more open. When I get nervous, now, or angry, I always return to my breath to cool down." "They taught through games and we still learned a lot. It helps you in your relationships with other people, makes you very open and under- standing." "You can use it subconsciously, for balance and coordination." "The group work was very important. You learn how to find your own way in a group and one thing we learned is that if it didn't work in one way we could try another. That was when we were "Crossing the River". It gives you a spiritual opening without anybody ever mentioning the word spiritual. It helps you to find your own spiritual centre more than any other activity. It brings up things in you which remain." It is the end of a class to illustrate the difference between tensing, stretching and relaxing. The children have been "contracting" newspaper, "relaxing it", "tensing it" and then "smoothing" the paper. They have tried doing the same thing with their bodies: contracting, tensing, stretching, relaxing until the concepts flow from the abstraction into the actual and back again. Now they have all the newspaper in bits and pieces about them. With more in reserve, the teachers start throwing the paper at each other and at the children. Soon the room is a blizzard of shredded paper, the children laughing, jumping and tossing the paper about wildly. At any moment a class may move from being deeply focused and intensely serious to the purely playful. Often it is impossible to tell where work ends and play begins, or play ends and work begins. These snapshots are an attempt to catch the wisdom, the vitality and the beauty of Awareness through the Body in action. With skill and the same philosophical stance, any practitioner could recreate these situations with the ensuing and gratifying results in children's growth and appreciation. Most of the special materials required are easy to obtain: broom sticks, metal camping plates, candles, rope, old news- paper, bean bags, and so on. You do need large open spaces, but a gym, a classroom with the furniture pushed back or an empty playground will often suffice. 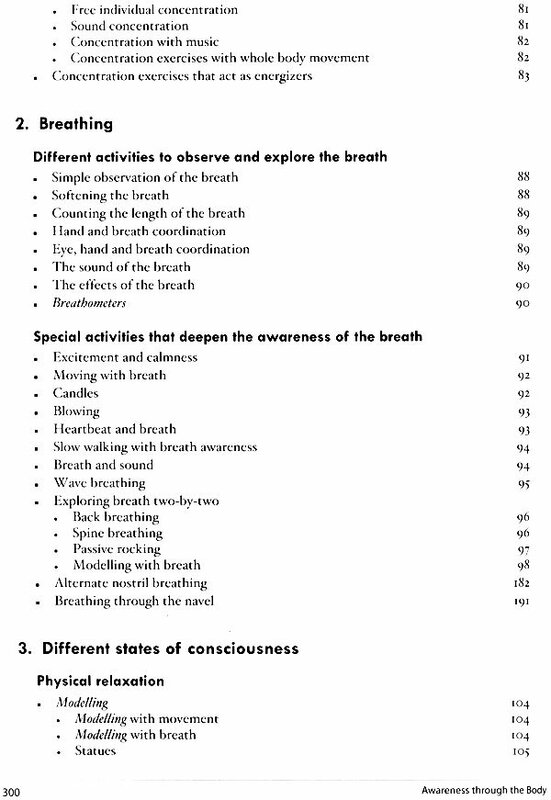 You do not have to be athletic or skilled in one of the arts of the body like dance, hatha yoga or martial arts; many of the exercises are as simple as breathing, though breathing itself will not seem simple when you summon awareness to the task. 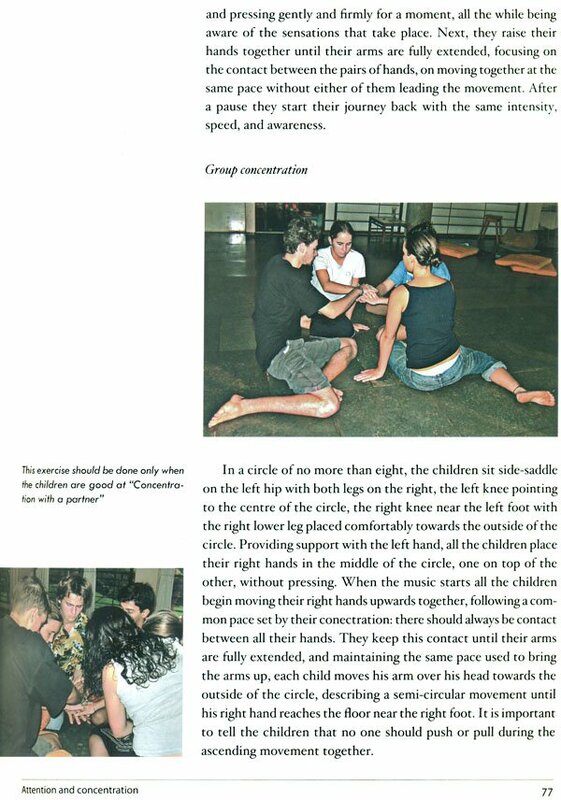 Carefully and precisely Joan and Aloka describe each activity, walking the reader through the exercises as they do them with the children, often sharing every aspect from introduction to concluding relaxation and discussion. What is more, they have included the "why" as well as the "how to" explaining in a variety of ways not only what they do but why they do it. When you are cognizant of the reasons behind an activity then you are empowered to make adaptations, and to create your own variations while still being true to the spirit, if not the letter, of the instruction. If readers hear an accent, a little stiffness in the prose it is because Joan and Aloka are writing in a language three times removed from their native Catalan: Cat-English they sometimes call it jokingly. The Awareness through the Body classes are all taught in English but as they work together with the children they can talk to each other, quietly, in Catalan. Finally, if you are interested in value-oriented education, or in teaching values, there is no better primer for you. 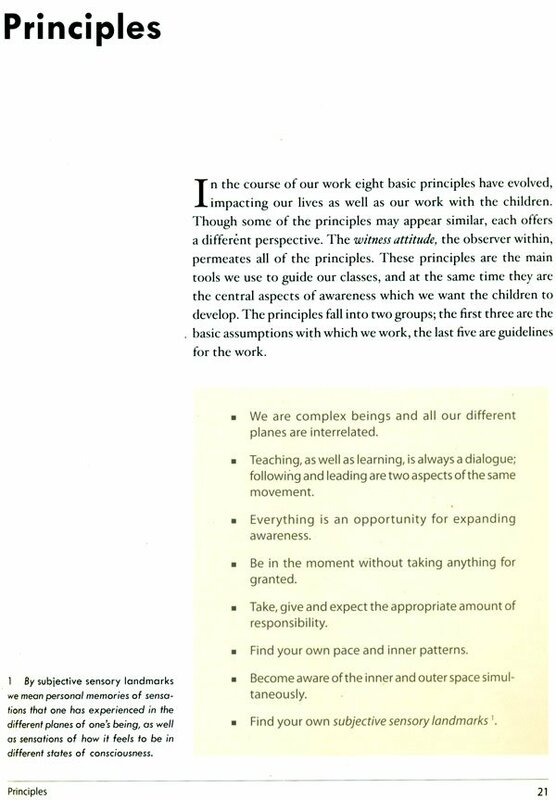 Implicitly and explicitly, this manual is about teaching the values of respect, harmony, being truthful with one's self and others, integrity, care, and, of course, awareness. Joan and Aloka model these values, lead the children into discovering them for themselves, and illustrate their presence or absence in numerous ways. For instance, when the whole school was focusing on the value of "respect" for the year, the directions in a partnering exercise might be: "Respect your partner's space. Notice when you come so close that he becomes anxious, notice how you are feeling yourself," carrying the abstraction of respect into the concrete world of behaviour naturally and without preaching. Even if you have no professional interest in bodywork, for the implicit teaching of values alone, this manual is a store of treasures. An equal and integrated address to all aspects of the person. The omnipresent thread of reflection which runs through all the activities: learning through witnessing, learning from doing and from noticing what you are doing, the opportunity to make mistakes in a safe environment and to learn from them. An unspoken but implicit trust in the students to find their own way with the right balance of challenge and support; and respect for the strength and competence they do not even know they have. The integrity of the work which remains true to its principles in every manifestation; in attitudes, instructions; the pacing and structure of activities, the processes, the forms of evaluation, the tone of voice. In a fashion similar to the way the work respects the learner, the manual respects the reader. You may go through this manual, trying out the activities at your own pace and in your own sequence. The instructions are specific enough to provide guidance and support, but the adaptations you will have to make for your own students and your own circumstances challenging enough to give it zest and variety. It may be hard work but it will be lots of fun and the results may surprise you. In Catalan, Bon Viatge! This book is meant as a guide for those who want to discover the existing connections between mind, emotions and the physical body and to offer ways in which to integrate these different parts into a more harmonious whole, organized around their inmost centre. Because we use the physical body to achieve this task, we call our work Awareness through the Body. 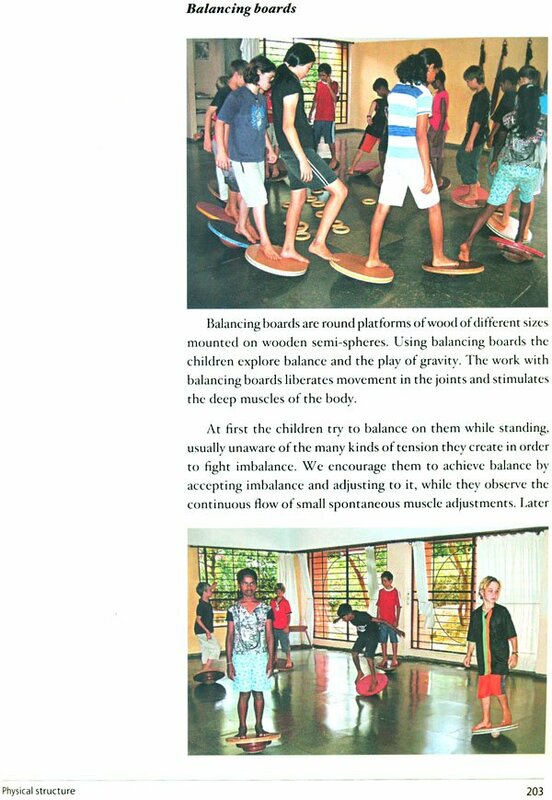 We developed this approach while working with children at schools in Auroville over the last fourteen years. Auroville is an intentional, international community located in south eastern India, inspired by the teachings of Sri Aurobindo and The Mother. The Auroville schools provide a learning environment for children from 31/2 to 18 years of age (kindergarten through twelfth grade). At this writing, there are 246 children from more than 20 different nations in attendance. The main medium of instruction is English though most of the children speak another first language. 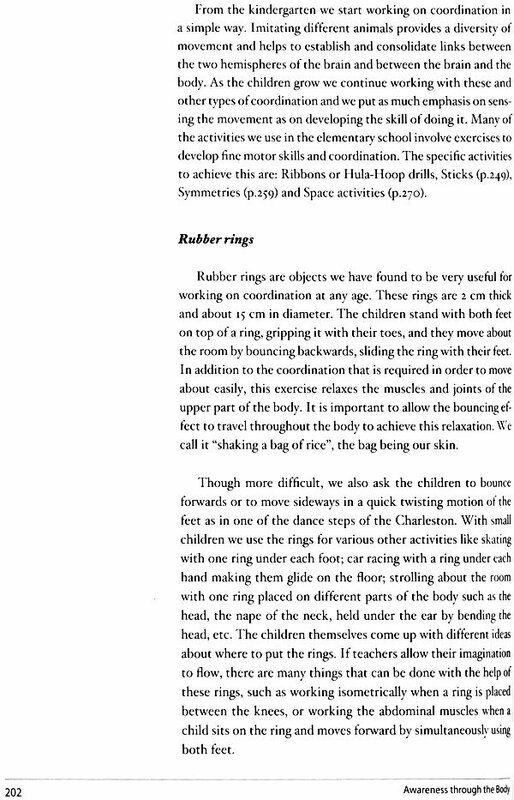 This book is focused mainly on our work at the elementary school level; however, you will find references to how we introduce Awareness through the Body in the kindergarten. We also use the exercises described, with slight modifications, with older children and adults. Awareness through the Body is a comprehensive curriculum of exercises that aims to raise awareness and enable children - and adults as well - to become conscious of their own perceptions and abilities so that they may become self-aware, self-directed individuals. The activities are creative and often fun; they develop gradually and encourage concentration, focus, relaxation and a sense of accomplishment. The programme works by first bringing the individual into a state of receptivity in which he can better "listen" to the many and varied inputs he is continuously receiving from both his inner and outer world. The exercises then allow him gradually to discover the complex amalgam of which he is made and to find the tools to manage this complexity effectively. Contemporary society has become extremely demanding, eating up the time we need for ourselves, imposing its stressful rhythms on our lives, colouring whatever we do and how we feel. We often find ourselves pulled toward the outside world, forgetting our own inner world, our own perceptions, feelings and aspirations. This book offers practical exercises to help all those interested in awareness and self-discovery to understand themselves better, to increase their capacity to be present and to better manage mind, body and emotions. It is intended as a contribution to a more aware and harmonious life. Teachers will find many of the exercises useful for their students. They can also derive insights from them, and from the philosophy that lies behind. The exercises can be adapted to fit many different needs and situations. Our hope is that the book can become an inspiration for teachers and can make education more creative and effective for both teachers and students. It may even inspire you to develop a similar programme in your own school, or you can adapt some of the activities for your own classroom. For instance, breathing and concentration exercises are a good way to start or end the day; games are good for building community spirit, invigorating a class or releasing tension; themes and activities may be integrated into academic subjects. In our work we hope to offer children tools for life, but not only children, throughout the book the word "children" may be exchanged for "individuals" at any time. Let's take breathing exercises for example; this type of exercise can be introduced in the everyday life of any person; the well-being or inner peace experienced after these exercises can make anyone's life more harmonious. Overcoming the difficulties that may arise during certain exercises - getting confused about which way to go or how to go, being afraid of an obstacle, feeling anxiety or restlessness in anticipation of what has to be done, lacking patience with oneself or the others - are ways to learn how to overcome the same type of difficulties that can arise in the middle of a busy day, in one's work or in the market place. Like children, adults can become more aware of themselves and how they act, and can acquire new tools for dealing with difficult situations. We follow the teachings of The Mother and Sri Aurobindo which aim at awakening consciousness in oneself and at realizing that we are evolving beings moving forward towards a next step in evolution. The ultimate goal in their teaching is to become aware, to reach and manifest on earth the divine principle present inside each one of us. Their thought permeates and provides a general framework for the whole of our work. 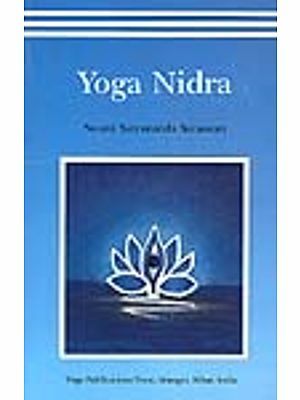 Within this framework, we have borrowed and blended elements from a multitude of disciplines, including dance, hatha yoga, Taoism, martial arts, physiotherapy, shiatsu, relaxation and breathing techniques. For example, in our exercises we have incorporated the "Inner Smile" from Taoism and Surya namaskar from hatha yoga, and the activity we call Structure Settings is based on the work of Elfriede Hengstenberg, which we have modified for our own purposes. Over the years we have identified activities that are particularly useful in reaching our goal- the expansion of consciousness. Some of these come from different but specific sources. We have adapted and rearranged each one in order to facilitate the attainment of our goal. For us, reading about or experiencing a technique during a workshop has always been the key to an inner storeroom full of new possibilities. We have often found ways of working similar to our own, that have enriched our work with the different perspectives and experiences of those using them. We thank each one of these people for the inspiration they have given us, and above all we thank the Flow that has put them in our path. The Mother, founder of Auroville, says about the future city: "Auroville wants to be a universal town where men and women of all countries are able to live in peace and progressive harmony above all creeds, all politics and all nationalities. The purpose of Auroville is to realize human unity." When Auroville was founded in 1968, people started to come from different parts of the world to join the emerging township. The beginnings were a real pioneering time - trying to build a city on barren, eroded land. As families with children began to arrive, several different educational experiments were made following the guidelines given by The Mother for an integral education. This development was quite spontaneous and the people who were involved were not always professionals. Often the needs of the children would give the direction to such experiments. In 1984 the need was felt to create centralized schools for children of different ages which among others gave birth to Transition School. Transition School has had two decades of unique, intentional, exploratory growth. Nowadays it serves as an elementary school for the Auroville township. Its aim is to promote human unity and to help children develop to their full potential. The school's programme initiates what is intended to be a life-long process of individual development towards a balance of body, mind and spirit. Children of different cultural and ethnic backgrounds learn and grow together in an atmosphere of protected freedom and harmony, developing an understanding that we are citizens of on world. The deepest aspiration of Transition School is to prepare the children and its teachers to live in a higher consciousness: to manifest a truer and higher life on earth. The school programme is child and process oriented. Attention is given to the student academic progress, motivation, attitude, and the ability to work in a group; each subject is viewed as a tool for self-discovery, as well as an aid to the advancement of knowledge, skills, creativity and self expression. Awareness through the Body is an integral part of this goal. In Section I we present our goal, the principles we work with our objectives, and the organization and flow of our classes. 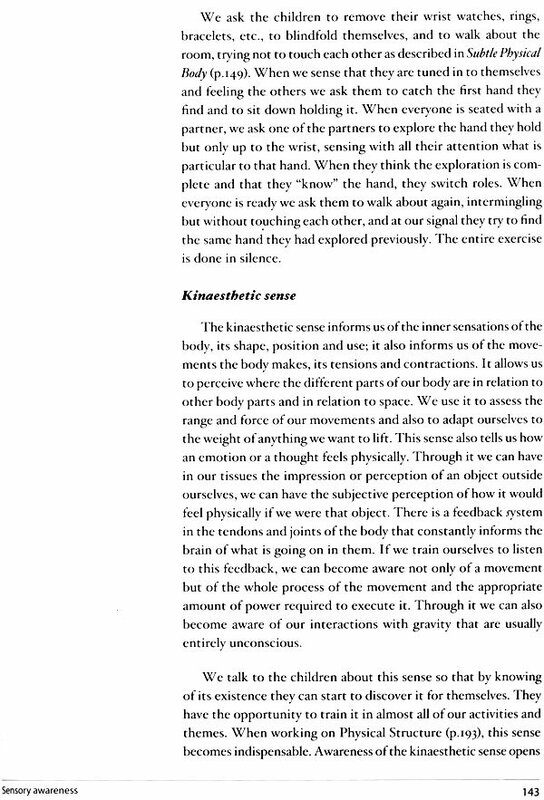 For better understanding of Awareness through the Body we recommend that you read this section first to get an insight into the underlying philosophy that permeates our work. 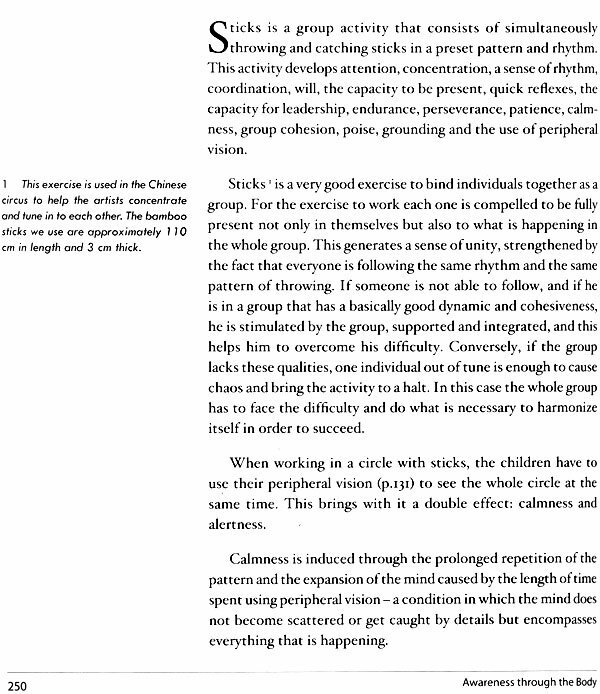 As a result the exercises presented in Section II will acquire a deeper meaning. 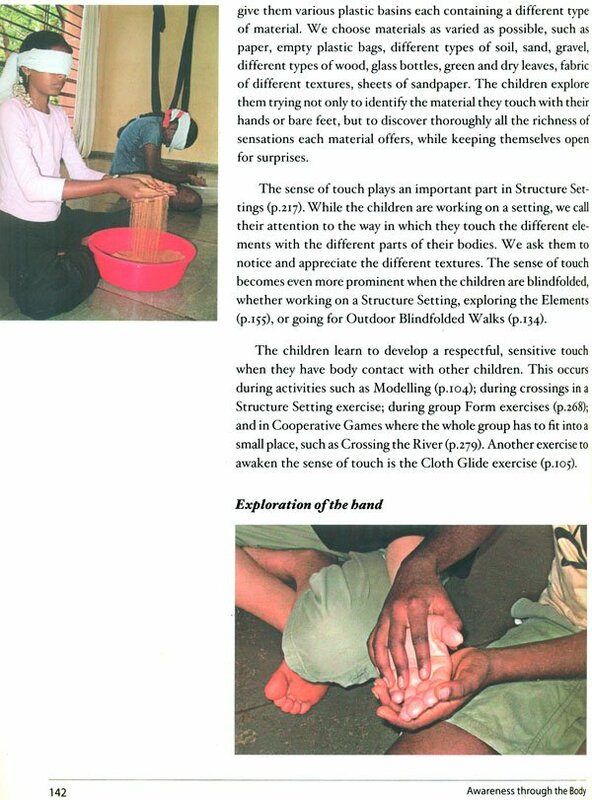 Section II contains the description of the themes we work with and the activities we do with the children. In each chapter you will find a description of the exercises, their benefits, their manner of presentation, the different possibilities for their exploration, and our experience with them. All these exercises can be used in many ways and in different circumstances: they can b expanded, shortened or adapted to any "need"; they are as useful in a class with children as in one with adults or for practice on one's own. 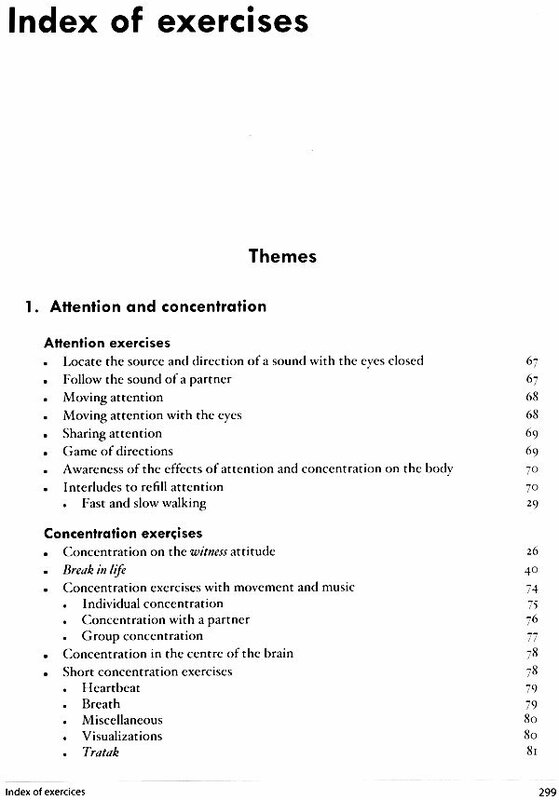 At the end of the book there is a complete index of all the exercises. If you plan to present any of the exercises to a group, we urge you to try them beforehand. You may need other people to try out an activity. If none are available, do whatever you can on your own and spend some time experiencing the activity in your mind with as many sensory details as you can imagine. The idea is that you get a clear sensory experience for the exercises before sharing them. It is important to know in your own body what the exercise does so that you can convey the intention appropriately. Once you are set on leading a session, remember to give yourself time, to trust yourself, to keep in mind the goal behind the exercises, and to remember that Awareness through the Body is a way of increasing awareness for the leader as much as for the students. Sanskrit words or words with a meaning different from common usage will appear in italics.